In the past 10 years or so, social media has been gaining more and more power with each passing day. It should be acknowledged that there is no stopping of the force that made these social media sites must-have tools. The best plan of action at this point is to use social media to one’s full benefit. Budding businesses should make it a point to build a community of followers, which can soon be turned into paying customers. 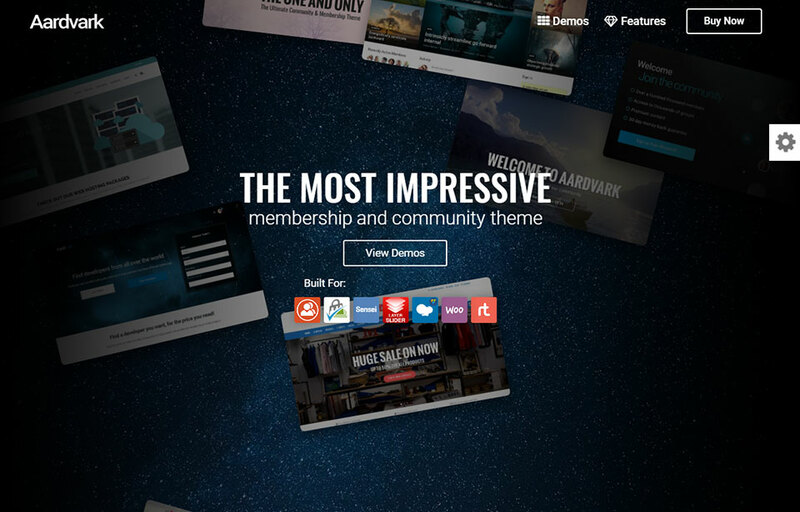 This post reviews powerful community WordPress themes. There are many tactics currently being used to engage and build a lasting customer base. These tactics can help customers share knowledge and requirements of a particular business by word of mouth. This helps a business grow by creating a loyal fan base of consistent customers. To help businesses grow WordPress has come to rescue by providing many features that allow them to build Social media community on their website. Just a Social Media community WordPress theme would suffice as it allows the user to sign up, share content, create discussion forums, and integrate all useful tools onto your website. 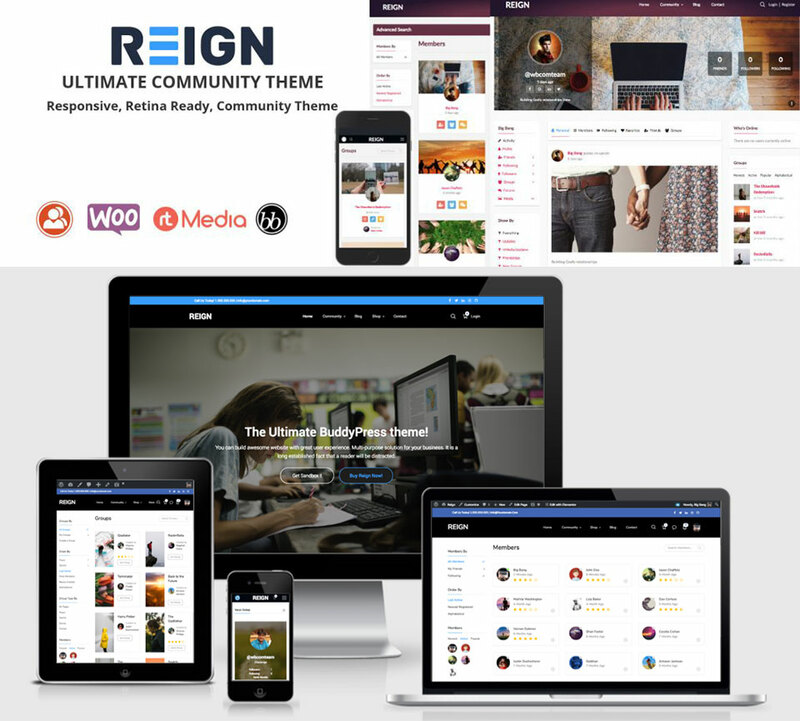 A fully responsive and innovative theme in the WordPress market, Reign is a dedicated BuddyPress theme designed to create professional-looking community, social network, and forum websites. It is a highly flexible, fully-responsive, RTL-supported lightweight and fast SEO-optimized theme. It even allows you to convert your community or social network into a social marketplace, or social e-learning platform. Reign Theme offers beautiful header and footer sections (you can even create one with Elementor Page Builder), multiple layouts for members and groups page header as well as members and groups directory. Moreover, you can display groups, news, members and sitewide activity on the sidebar with the help of dedicated BuddyPress Extra Widgets. Reign even offers inbuilt support for WooCommerce, Easy Digital Downloads, Paid Membership Pro, bbPress, and many more. You can also check a variety of Reign BuddyPress Demos and play with their live sandbox as well. 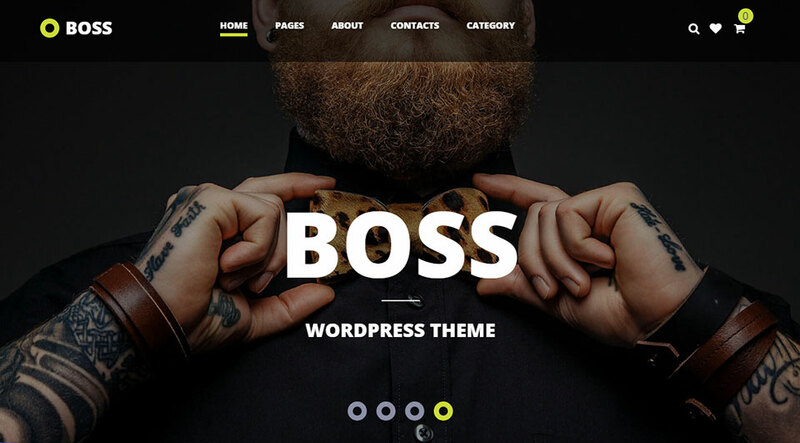 To be honest, I have never heard of such a heavy name being used for a Community WordPress theme, but Boss is the perfect fit which reflects exactly what it is all about. The best thing about Boss is that it is jam-packed with amazing features and has an extremely user-friendly theme. They offer an admin panel that lets you mold and customize layouts, colors, fonts, headers, logos, image sliders, and many other necessities according to one’s needs. The bombardment of features does not stop at this point. 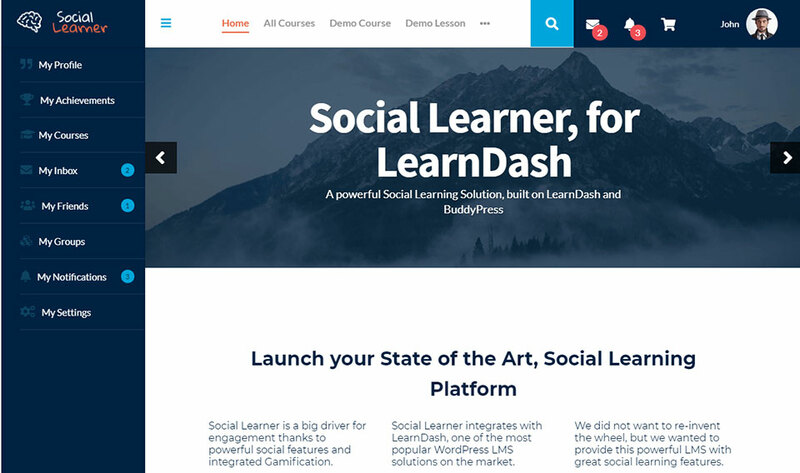 They also provide some special add-ons like the social learner that helps all users indulge in e-learning along with some of the most popular learning plugins such as WordPress, LearnDash, and Sensei. They also offer WooCommerce support in addition to social integration options. This theme is just the thing all nerds and geeks were looking out for. It is an amazing BuddyPress theme for e-learning websites which would definitely quench the thirst of all those starving for knowledge. This theme helps you create and stay in touch with a community of people who can engage with each other, share knowledge, ask questions and reach conclusions based on knowledge and healthy discussions. Apart from these features, they also help you present and display your content in an appealing manner by using live notifications, more than 500 high-resolution fonts, and WooCommerce. OneSocial has offered some really new features that have helped it set it apart from other themes. Some of the impressive features that deserve to be mentioned at this point are; User managed blogging platform, multilingual support, and WooCommerce support. The list does not quite end here as there are many other features that would take up quite some space. The theme has an installer that works on the principle of one-click, and a user-friendly admin panel that helps you customize widgets, layouts, sliders and social integration with much more simplicity and efficiency. In short, OneSocial is completely capable of helping you create a social community that is at par with any other established community. Even though we were on the subject of Social Media community WordPress themes, Divi theme is not just limited to social media and functions as a multi-purpose theme that can work for any niche website. 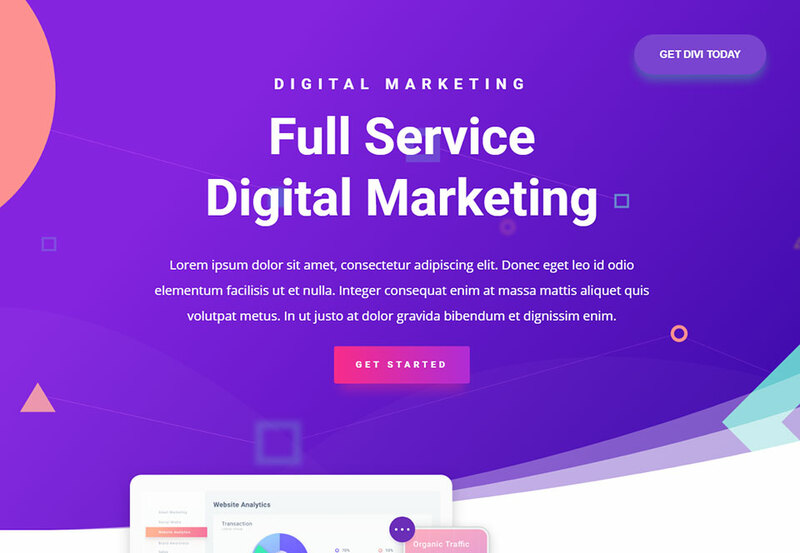 Divi theme promises to help you create a website that really stands apart from other sites and upgrades your online business. The team at Divi theme is not stagnant and is constantly working to equip them with new and improved themes. Divi theme can easily boast of being the most powerful front-end builder for WordPress. It is backed by a Divi builder which works as a drag and drop builder for WordPress themes. You can get started as soon as possible by adding any module to any section of your pages and start the editing process in the front-end of your site. 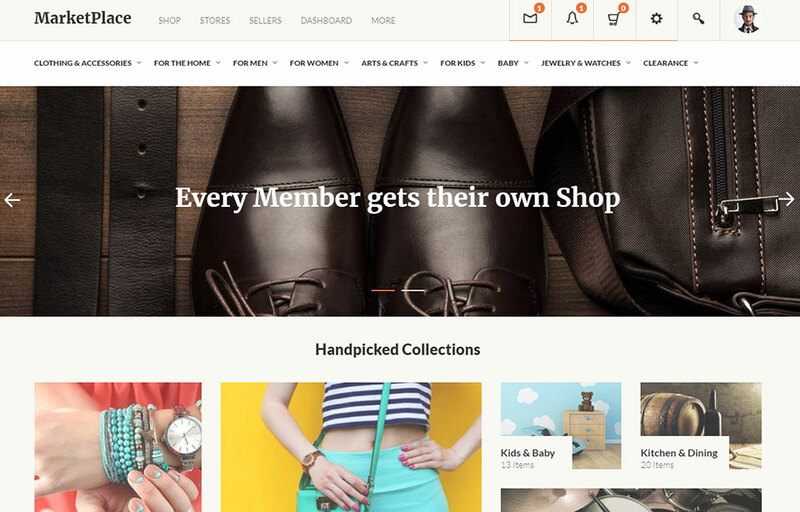 Now since we would not dare leave the shoppers behind, the Social MarketPlace is a Social community WordPress theme that can help create a community of online shoppers. They have been supported by WooCommerce, WP Vendor, and BuddyPress which have helped them come out as a new and practical concept. Social MarketPlace helps online sellers work with new features that allow them to customize the website with the help of an admin dashboard and some advanced features such as order tracking, commission management, and store search. For those looking to create a membership community that requires users to register and then signup, Aardvark is the best bet. 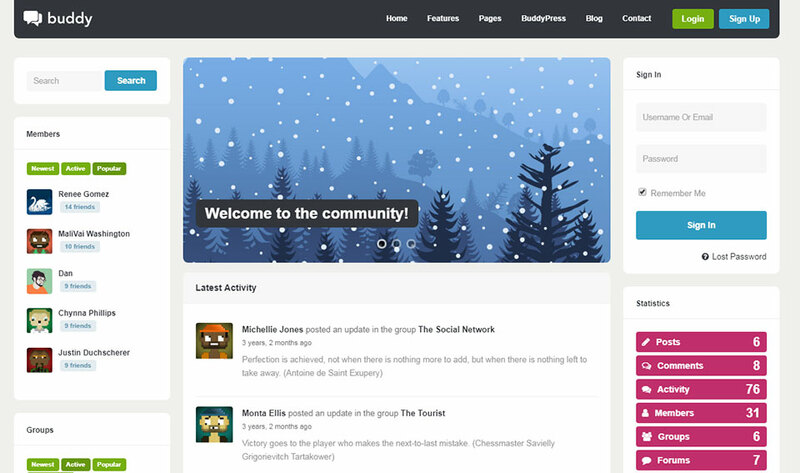 The theme is also compatible with the BuddyPress plugin which allows it to expand by adding a few more Social media features into the site. This theme can easily help create any sort of niche community websites such as blogging, e-learning community or an e-commerce community. The customizing options are quite vast and can help you create a website to your own personal liking with absolute independence. They also provide many ready to be used demo design templates for immediate use. 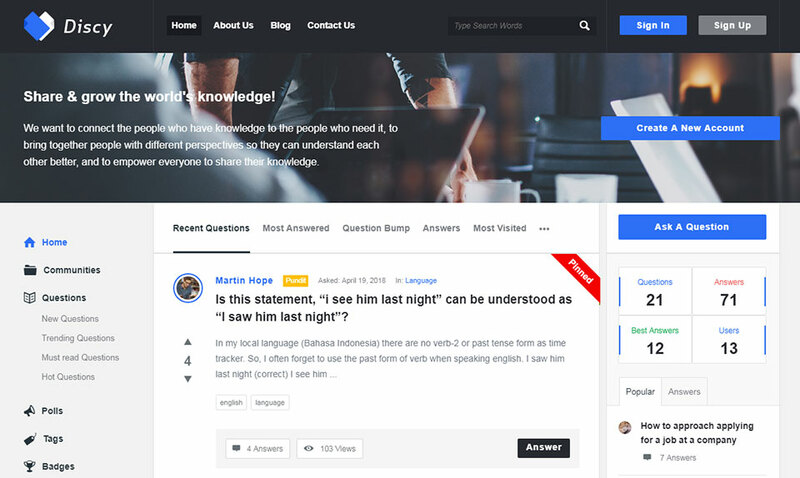 This theme is somewhat inspired by Quora and is paired with an elegant yet modern looking design that will enable you to create a premium order community. They also offer the option of monetizing your traffic with the help of advertisements which can help create an overall engaging community. Apart from a basic question and answer theme they also offer poll and survey options. So essentially, Discy is a one-page interface that helps users easily submit their questions and receive well thought out answers for their queries. Buddy is a highly adaptable theme that works well enough for any type of website be it business, magazine, portfolio, or even a community. Buddy caters to all the needs of a modern social community by offering a responsive layout, SEO optimization, and a retina display. Your social media community will be ready in just a jiffy. We won’t be leaving behind all the Romeos in search of their Juliets. Sweet Date helps all those planning to help lovers unite. Sweet date offers a highly user-friendly theme that allows users to register, create accounts, make friends, exchange messages and even get matched with potential dates on the basis of compatible interests. It makes the users experience even simpler by introducing features such as social search, notifications, Facebook login, and a mobile responsive design. Thus, this theme helps create websites that cover every aspect of a social being’s life. The following themes are worthy enough to be included in the top community WordPress themes for website building. They are highly rated due to the fact that they cater to the needs of almost all website builders and audiences. We hope that this article might help our readers discover a theme that fits their needs. Asad Ali is an internet marketing expert with a focus on eCommerce SEO & Paid media. Currently, he is working for GO-Gulf – a Dubai based website development agency. With over 8 years of experience in SEO, user experience & conversion optimization, Asad has helped numerous businesses to achieve their goals throughout UAE. You can reach him on LinkedIn.